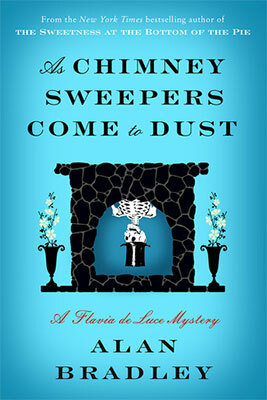 I wanted a mystery for a change and picked As Chimney Sweepers Come to Dust for the never-ending praises about the Flavia de Luce series. No need to read them all, each volume is supposed to work by itself. Does this one too? No. And by that I don’t mean it requires previous knowledge, I mean that the book doesn’t work. This story doesn’t make sense. Let’s start with Flavia. At first, I found her interesting. The book opens with her saying “If you’re anything like me, you adore rot”. I certainly don’t, but I like quirky and slightly creepy characters. Unfortunately, I rapidly found myself wanting to whack her over the head. She is utterly self-important and condescending, judging people with comments like “I knew the type all too well”, and acting as if people were at her disposal. Despite her self-assessment as precocious and smart, she bored me to death by pretending to be sick over and over again to sneak away from school and go “investigate”, which, by the way, meant asking questions to people who never wanted to answer. The story progresses with Flavia jumping on conclusions on every slightest “finding”. Sometimes, I even missed what exactly was the clue that triggered her insight, but that must be because Flavia is so infinitely brighter than I am. Was it wrong to be so deceitful? Well, yes, it probably was. But if God hadn’t wanted me to be the way I am, He would have arranged to have me born a haddock instead of Flavia de Luce – wouldn’t He? So, I was on page 200 when I started wondering if the investigation would ever start, and on page 300 when I understood there probably wouldn’t be any. Flavia doesn’t investigate: she spends most of the story meeting schoolmates whose names you won’t remember since their character are under-developed and tend to disappear later on. The rest of the time, she pretends to be sick to leave class and even throw up on other people’s clothes. She also has secret meetings about secret societies so secret that their members refuse to talk about it except for “pheasant sandwiches”. She learns about the disappearance of students which will remain unexplained except for one of them, elucidated in a spectacular display of hogwash. She plays creepy tricks on innocent people, like writing bloody fake letters that won’t teach her anything anyway. She does many (boring) things, but none of them qualifies as investigating. Disappointing, in a mystery novel. If only the mystery made sense. But the means and motive of the crime are so utterly ridiculous I found myself laughing at it in disbelief. That corpse, found in a chimney at the very beginning of the story, could only have ended up in there if all laws of physics had been abolished. I also wonder what school dormitory is so bad that the smell of a rotting corpse wouldn’t raise alarm. Finally, the perpetrator’s motive is downright implausible but in the mind of a psycho kindergartener. Everything else surrounding the murder sounds like people trying as bad as they could to behave like morons. It’s such nonsense that till the very last page I hoped for a “real” solution: I thought maybe Flavia had created this absurd tale (kids are creative and all that…). No luck. I’m very willing to forget about As Chimney Sweepers Come to Dust. It’s just disappointing and boring, the characters are underdeveloped, Flavia is annoying, childish and arrogant at the same time, there is no investigation to speak of and finally the means and motives of the culprit feel like a drunk prank. Do not read this book as your first Flavia de Luce book. If you’re an absolute fan of the series, you might want to read it to keep on top of things (the novel mentions Flavia’s mother Harriet and the Nile society) so my advice is to get your less favourite auntie to offer it to you, so you won’t feel completely bamboozled. I’m sorry you hated the book but I really like your review – your anguish is palpable. And probably the worst thing about it: you won’t forget the story because it’s always the silliest things that stick, right? Oh dear! I don’t think I’ve ever seen you write such a negative review before (although, yes, this book sounds pretty horrible!). I definitely won’t be reading it. Miriam @ Inky Realms recently posted…I mustache you some questions! As Chimney Sweepers Come to Dust was just published this month, and I purchased it, and for some reason I forced myself to finish it… I thought I might as well write a review. Is this the first Flavia de Luce novel you’ve read? If so, I understand your confusion, and it is certainly not the best of the lot. That said, overall I love the series, and find the best way to get through the books that aren’t as good as the others is to listen to it on audio, as they are brilliantly done. I am very glad there is only going to be ONE novel set at Miss Bodycote’s. All this said, I’m not sure what your favourite books are, but this is not a y/a book (I read some of those, too). Some of the best books in this series are 1, 3 & 5, although 6 is a strong contender, too. I’ve read the first three Flavia de Luce books and quite enjoyed them! This is the last and sixth (?) in the series, and it’s possible the author has just run out of steam. But yes, she is sort of an odd duck, that’s for sure! This is one mystery series that is much better read in order. In fact the latter ones definitely need to be read in order to understand her reflections of previous times. Did you understand Dogger’s impotance and history to the De Luce family? This book, a history of Harriet is needed because it is not explained at all. I love the series but I read them in order on a suggestion from friend. I must admit, this took a bit more to get caught up in mystery. I am glad Flavia returning to Buchshaw. I like the setting of Buckshaw better.